Gavin apparently put up a response to Steve McIntyre now as well. I almost never check over at Real Climate but always know what’s happening from other peoples comments. Their post is very silly from a scientific perspective but will read well for their attack dogs. I’m becoming pretty familiar with these reconstructions and methods for an aeronautical engineer and I’m not really interested in defending Steve McIntyre but ya know, sometimes it needs to be said. Step 1 – find the most extreme and uninformed conclusions. Step 2 – Shift suddenly to serious sounding discussion with no real substance. So along comes Steve McIntyre, self-styled slayer of hockey sticks, who declares without any evidence whatsoever that Briffa didn’t just reprocess the data from the Russians, but instead supposedly picked through it to give him the signal he wanted. These allegations have been made without any evidence whatsoever. Step 3 – Make straw man accusation. Steve never said this IS what happened, and it is actually irrelevant to his post. Step 4 – Discredit work by making it seem un-thorough. As though the IRTDB is an improper source for tree ring data, and somehow Steve McIntyre didn’t understand exactly which dataset he used. This was a well understood set of tree rings chosen because they are considered thermometer trees in publication and are actually at the exact same Yamal sight. I found the internet comment particularly amusing considering that the data Steve used was posted by climatologists on the internet and we’re reading the refutation by climatologists on the internet – tongue in cheek disparaging the internet. Irony abounds at RC. Recent quote from Keith briffa – However, there is clearly a latent and deeply felt wish in some sectors for the whole problem of global warming to be reduced to a statistical quirk or a mistake. This led to some truly death-defying leaping to conclusions when this issue hit the blogosphere. Step 5 – Shift back to ridiculous extreme statements, implying that Steve McIntyre somehow supports this rubbish. The timeline for these mini-blogstorms is always similar. 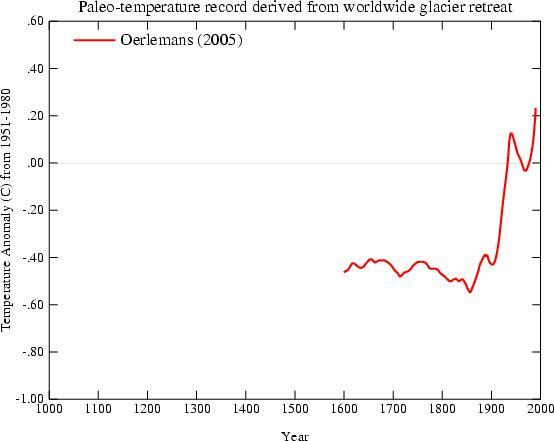 An unverified accusation of malfeasance is made based on nothing, and it is instantly ‘telegraphed’ across the denial-o-sphere while being embellished along the way to apply to anything ‘hockey-stick’ shaped and any and all scientists, even those not even tangentially related. 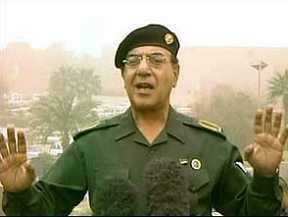 Step 6 – Declare victory by using denialist ad hom’s, and declare the whole thing meaningless. BTW: I verified the work myself boys — DID YOU?! Step 7 – This is the section which prompted me to post. Present an overwhelming pile of evidence that others have concluded hockey stick temp curves using non-Yamal data. Something SteveMcIntyre describes quite explicitly in his post was exactly which papers were affected and which were not. I’ll show the graphs below and tell you what I see from my year of studying the features of these papers. 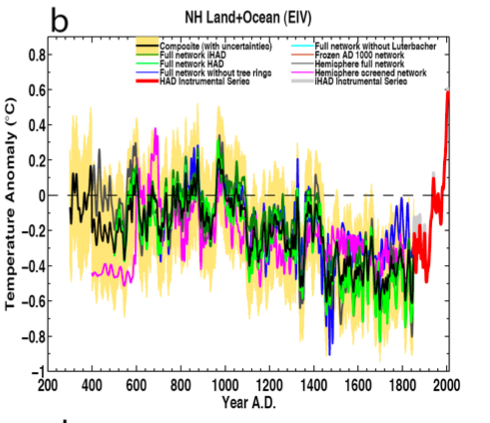 The famous original hockey stick (redux), created using decentered PCA and known incorrect methods on very questionable data – Not Yamal data. This has been repeatedly proven incorrect and should be ignored. Very short glacial retreat record where only about 5 glaciers represent the globe pre 1800. Note that nobody’s claiming it didn’t warm here. Borehole reconstructions, the worst kind of proxy. Completely useless for temperature reconstructions due to water flow through the boreholes. CO2 concentrations, plotted on a highly shifted scale – a moot point. However I note, no attempt is made in Yamal or anywhere else to correct (reduce) tree growth measurements for increase of CO2 availability. Arctic temperature reconstruction – no Yamal. 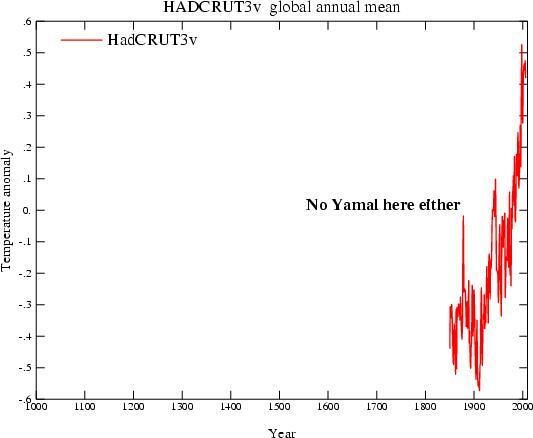 Note that without Yamal the blue line becomes warmer in history than in recent times. Also note the HadCRUT curve is used. It’s no coincidence that this dataset with the highest surface temperature trend (bright red) and is clipped at around 2000 to make sure that we don’t see the downward dip in temperatures. Also note that the authors of the dataset source will not release source data or methods for their massive corrections to the temperature record. This is being presneted here with dishonest intent in my opinion to make the temperature graph appear stronger than it is. – There is no shame in advocacy, just admit you’re doing it. From Mann08, a graph of northern hemisphere temperatures (again with Hadcrut overlayed obsuring the non-unprecedented endpoints). This hockey stick is created by sorting a thousand series for those which match temperature best and throwing away 60 percent of the data. Highly disingenuous in my opinion. Hadcrut data itself, again clipped at 2000. This data is overly corrected in relation to all other datasets. You get the point. More hockey sticks don’t make the story better. Steve McIntyre keeps insisting that he should be treated like a professional. But how professional is it to continue to slander scientists with vague insinuations and spin made-up tales of perfidy out of the whole cloth instead of submitting his work for peer-review? He continues to take absolutely no responsibility for the ridiculous fantasies and exaggerations that his supporters broadcast, apparently being happy to bask in their acclaim rather than correct any of the misrepresentations he has engendered. Now of course this was one of the dumbest comments we’ve read in a while. Basking in the comments of acclaim?! Steve has no control over what people write, he can only snip them but to gavin and the rest — HAVE YOU READ YOUR OWN RC THREADS — EVER!!! Anyway, this RC post has no real content whatsoever. I mean there’s no criticism of the trees used to replace the Yamal set, there’s no claim of other better data, there’s only false accusations, straw man arguments and presentations of one bad hockey stick result after another. Me thinks, Steve may have struck a nerve. This entry was posted on October 1, 2009 at 12:11 pm	and is filed under Uncategorized. You can follow any responses to this entry through the RSS 2.0 feed. You can leave a response, or trackback from your own site. From RC: The best studies tend to test the robustness of their conclusions by dropping various subsets of data or by excluding whole classes of data (such as tree-rings) in order to see what difference they make so you won’t generally find that too much rides on any one proxy record (despite what you might read elsewhere). An interesting statement, considering the AGW crowd bases its entire canon solely on fluctuations in CO2 levels. “Are you saying that there likely was a sharp shift uppwards in 20th century temperaturs on the Yamal peninsula? Or do you think that this assertion may be questionalbe? Even Gavin is not ready to stick by Briffa’s Yamal conclusion, now. If that question had been asked last week, he would have fully endorsed him. Good job dissecting their hastily put together “defense” (obfuscation). That piece is disgusting, even lending credence to Algore. I noticed they took out the picture of the Algore forklift graph, as a matter of fact all the rest of the pictures of graphs are now only viewable by clicking. The warmers that drop by there don’t need any references. What the heck is the source data for that “Arctic temperature recon” – ? Jeff, a classic deconstruction, it helps to see the steps. Steve could surely have RC on charges of slander alone. 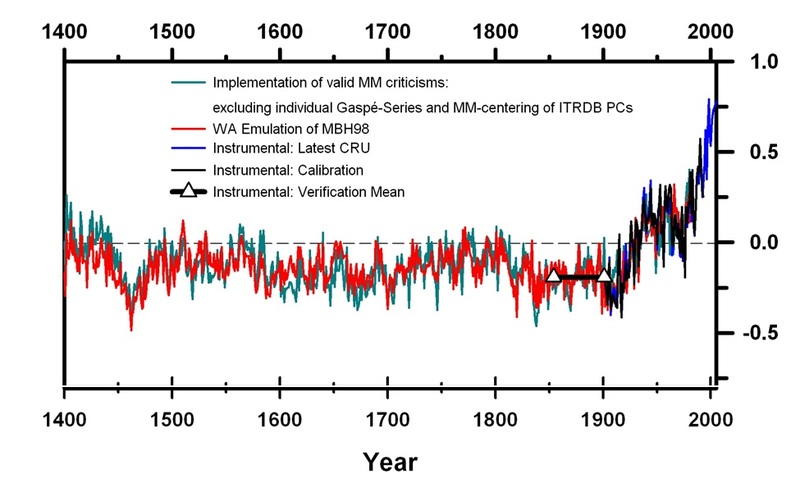 As to the last “Hadcrut” data – what about Central England temperatures since the seventeenth century? Armagh and De Bilt following close on? And WORKING OUT how to do a reasonable UHI deduction (evidence required)? oops on the pictures at RC, they are still there. Did you see Lucia’s precedence claim for that last graph? LMAO. I agree there’s been a lot of over-reaction from the “anti” crowd and this hasn’t helped the debate. However I don’t think Briffa has covered himself in glory here. Firstly he has been remarkably secretive about the data used to create his reconstructions (9 years to archive data is a bad joke) and secondly his response to Steve M’s week of work seems to be designed to miss the point Steve M is making. For example the debate _regarding this paper_ is not whether the late 20th century was hot but whether Briffa has reliably reconstructed a robust proxy for temperatures over the last millennium. I understand that Gavin claims to be a scientist. One would never know from his comments. I’d have guessed he was more likely a rabble-rousing community organizer for ACORN. In response to PaulC #47 you miss the point about availability of data. The complaint is not that there isn’t enough data. It’s that (in the cases McIntyre complains about) there isn’t ANY data. In order to reproduce the published results, all the original data must be archived and made available. It’s not “more” data that is being requested here. It is the actual (raw) data used to obtain the results and conclusions in the peer-reviewed and published papers. If the raw data has been corrected to adjust for local factors then this correction process too must be described. Descriptions of algorithms are similarly insufficient. The actual algorithms are essential. Otherwise it looks like you are trying to hide something. Real Science can stand up to the scrutiny. Make (all) the data available and then, as in your example of GISTEMP, there can be no argument. McIntyre and other sceptics have no basis for challenge and must move on. As Helvio says in #45, if you don’t provide the evidence, it’s not scientific. Your reply there similarly missed the point. Science is PRECISELY about replicability. You put the cart before the horse when you say that it is important to replicate the *conclusions*. I hope this is just a bad choice of phrase but I’m struggling to understand how any scientist could hold this view. You need to be able to replicate the results. The conclusions are what you draw from the results and, as any good scientist will tell you, the results may not always support the hypothesis. In summary, every instance where the raw data and methodologies used are not published, leads to a significant weakening of the climate “science”. I struggle to understand the apparent reluctance for some (many) climate scientists to make their evidence available. Your excerpting Gavin’s last comment is informative. Gavin is being obtuse and he must know it. For some reason they will not let Briffa suffer from his own obstinacy. I do not know what is behind this stonewalling. My hope is that this is a sufficiently large issue that we will see what is going on when Briffa discloses how he chose the 10/12 trees he did. Sometimes when it walks like a duck, quacks like a duck and looks like a duck, it is reasonable to conclude that it is in fact a duck. That seemed like an interesting thought. Careful selection. Solid evidence. Wow. Maybe it would even be a good idea to create a priori selection criteria. For different types of trees, in different habitats and different regional micro climates. So I tried asking dhogaza’s opinion about strip-bark bristlecone pines. How naive. The comment never made it through moderation of course. Outstanding work, Jeff. I think Gavin has really made a fool of himself with this post. The blatant straw man — the massive sarcasm (such an utterly lame substitute for actual argumentation) — the failure to substantively engage Steve’s actual points — these are sure signs of desperation. My prediction: Gavin has really stepped in it and it will take a long time for him to get the stink off. All this (understandable) fuss about temperature reconstructions in a tiny area of the globe using a dozen or so tree proxies. Yet never any comment about global sea levels- representing a far greater area- that is re constructed from only three northern hemisphere tide gauges, whose data- interpolated to 1700- is based on inadequate and incomplete records stretching only to 1850. Has no one ever carried out an audit on those? Hey everyone I have solved the problem. I have solved the problems with cold fusion. I have all the data here! Limitless free energy for all. I will release my methodology and data in ten years, I might have to sneak it out but I will do it. But I promise the science is robust, I even got a few of the local kids who blogged about it to look it over, they said its fine. The science is settled. No more worries. A Nobel Prize and an Oscar for me please. Oh and loads of money too please. Hey Tony, thanks for stopping by again. Your post on the History of the Arctic is like the 3rd most read all time on this site now. People keep linking to it. Of course we’re all hoping for the next addition. Thanks Jeff. I’m working on it but it takes a lot of research and I do like to cross reference several sources. Incidentally great work on the tree ring saga. Email me at the right, I’d like to invest. #15, as a suggestion, do it about 1/3 the length and several posts if necessary. Good post, Jeff. I was almost riled enough to do the same thing on the graphs myself. I think I’ll take the opportunity to vent here (it’s the blog’s name isn’t it?) instead of posting at the propoganda site (out of sight?). The borehole graph is wonderful – one point every 100 years and only two and a half points to use for fitting to the observed temperatures – .5 degrees of freedom – don’t need a lot of stats for that. Only one graph with error bounds – and that uses EIV for fitting (the little brother of RegEM) – so who knows how these error bounds are calculated or whether the whole thing is meaningfully done. The Kaufman Arctic recon – that’s not a done deal yet – I have a sense that there may be some problems due to some of the proxies dropping out as you go back in time. The glacier recon – which conveniently stops at the Little Ice Age. The recent temperature record – all blade and no shaft – two minutes for playing with a broken stick – and an extra five minute misconduct penalty..
Is that the best they can do? I guess it’s just the thing the team supporters need to brandish around the burning bush. Thanks. That felt good. Good work, Jeff. #18, Even you have to let off a little steam sometimes. Thanks. Most of the hockey sticks don’t go back to 1000, so they are irrelevant. THe ones that remain are Kaufmann, another Briffa paper which actually got a critical comment in Science that the methods would create hockey sticks by chance, and Mann 08. But in climate science quite often when it walks like a duck, quacks like a duck and looks like a duck, it is reasonable to conclude that it is in fact an aardvark. Not so; the drilling mud seals the walls of the borehole, so water cannot flow in or out. then the hole is allowed to equilibrate before the log is run. Most of the hockey sticks don’t go back to 1000, so they are irrelevant. Is the irony intended? I understand George Soros funds both ACORN and realclimate.org. They are advocates for immediate AGW mitigation and provide scientific evidence and arguments for that point of view – and that point of view only. They are of the mind that false information is being intentionally disseminated by the opponents of immediate AGW mitigation and that those opponents can very effectively influence the voting public. It is their mission to counter that effort. When will you people understand? I’m sure you know more about drilling than myself, I’ve only read a couple of papers and had a few discussions. However, you’ve missed the point completely perhaps due to my poor wording. So what if the drill hole walls are sealed. The rock has been bathed in flowing water for a thousand years!!!! I’m just a friggin aeronautical engineer but you know even we know water carries lots of heat. Is there a single sane non-advocate scientist on the planet that thinks boreholes are actually useful?? I say emphaticly Hell NO!! When will the insanity end. Trees ain’t thermometers and neither are boreholes. Varves are the best of the worst and aint temp either. WTF is wrong with people. How the hell can a borehole tell ancient temps to tenths of a degree when flowing water is NOT even taken into account. Something like 90% of any river you’ve seen flows underground. If this factor isn’t even accounted for, the rest is moot. Jeff, I have spent some time replicating some of the borehole temperature reconstructions of Hugo Beltrami(1990’s), et al. None of the University of Michigan archived profiles that I plotted appeared to be corrupted by ground water. Chris V suggests how the the measurements are made, but the metadata associated with each of the archived borehole temperature profile is so poor, he must have some additional knowledge. Additional knowledge of 600 plus boreholes? Why isn’t it archived with the data? Simple metadata such as how the temperature profile was measured, what sensors were used, and calibration history, etc are not archived. The real problem is a simple linear algebra issue associated with solving Ax~b. Where A is a matrix whose columns are the solution to a 100 year pulse input using the heat conduction equation, b is the borehole temperature profile, and x is the temperature reconstruction. Now A is poorly conditioned even for a 500 year reconstruction, but one can get a solution for x using psuedoinverse Least Squares (LS) but it is very noisy looking. So Beltrami (1990’s) used a truncated Least Squares (TLS) and essentially throws away enough small singular values in the psuedoinverse TLS to obtain a reconstruction that looks like a hockey stick. But they have the audacity to claim that this is a unique temperature reconstruction and the correct one. If one keeps one more singular value in the TLS, then the temperature reconstructions looks significantly different. The literature has moved on in the last 20 years as how many singular values to keep appeared to be arbitrary. The literature moved to using ridge regression and now in the paper that Chris V recommends, the principals of Borehole reconstructions (Huang, Shen and Pollack) have moved to a “Bayesian functional space inversion scheme developed by Shen and Beck , incorporating a conservative null hypothesis as the a priori estimate of the surface temperature history.” I might note that the paper has only one equation listed and it is a very simple heat conduction equation. Another point is that A is created from a noise free physics equation yet it is poorly conditioned. The physics are telling us that high frequency variation (100 year) are not observable using borehole temperature profiles. Hugo Beltrami has a nice website with many of his papers on the early borehole reconstructions and are very readable for those interested. RC’s main criticism is on the lack of context in the various attacks on climate science, and this Yamal story is no exception. The fact that the sarcastic tone rubs you in the wrong way doesn’t invalidate this damning criticism. What should the context be wrt Yamal? What I find most strange about the RC post is that the link to Briffa’s answer – the only thing they really got – seems to be kind of hidden away and tend to disappear in all the ad hominems and armwaving. One should have thought they would appear a lot better posting Briffa’s answer as a guest post. #29 I don’t see any damning criticism whatsoever. I only see a bunch of hand waiving and noise. Which particular point is so damning? #28 I used to like boreholes as my favorite proxy until I realized how the math was being done and that the holes are drilled right in areas with known watertables. I’m not an expert and quite willing to be wrong on this though and am interested in how you know that the data was not contaminated with a thousand years of flowing water or anything else which might enlighten me. A “lack of context”? I am familiar with the fallacy of “taking a statement out of context” — but how does that apply to Steve’s analysis of Yamal? I second Tony’s question above: What “context” about Yamal is missing? You really must supply more information if you expect anyone to be influenced by the claim that this constitutes a “damning criticism”. Sarcasm — straw man arguments — failure to address the actual substance of Steve’s analysis — these are the tactics that desperate people resort to when they cannot generate any actual, valid argument. But perhaps I am wrong. Perhaps, somewhere in Gavin’s transparent attempt to smear Steve by associating him with crackpots, perhaps there lurks a valid “damning criticism” that I’ve missed. So please, Bart, “thrill us with your acumen” and elaborate on this eviscerating critique that we are too dense to fathom on our own. We seekers of the truth want to know precisely how Steve McIntyre has pulled the proxy over our eyes for the last 5 years. I agree 100% with Phil B on the inversion. I did a post on this topic when we were looking at the Steig truncation as there are some interesting issues in common. #33. I happen to know quite a lot about “boreholes” from my other life. The Canadian “boreholes” for the most part are from mining exploration (I chatted with Beltrami a few years ago about this. The word ‘Sarcasm’ is derived from a Greek word meaning ‘tearing flesh’, which is why sarcastic vegetarians are so ironic. I read the borehole post very carefully back then and if I recall, ran some of the code. I’m curious, what do you think about water table contamination of the surrounding rock and land. But how professional is it to continue to slander scientists with vague insinuations and spin made-up tales of perfidy out of the whole cloth instead of submitting his work for peer-review? Given that Gavin has a PhD and loves to use obscure words like perfidy, I’m not so sure I can forgive his use of the word slander, which refers to the spoken, not written, word. Perhaps he means libel because I think it would be very hard for him to find many statements made by Steve that were not written – certainly Gavin is not in the habit of attending conferences in which Steve is also an attendee, though maybe I’m wrong on this and he has a recording of Steve slandering someone. Ironically, such an accusation by Gavin could indeed be libelous in the absence of evidence. He should be more careful with his written word, and he should also buy a dictionary. The point I was trying to make is that the inversion issue trumps the other issues of water table, inhomogeneous material, and ground cover changes. My conjecture is that the borehole temperature profile slope would change at the water table. Of course, good metadata should tell one where or if there is a water table, and one wouldn’t use the borehole. #40 I see. Thanks for the explanation. Do you know from your work if there are studies based only on dry boreholes? I know. You would think they would have at least pointed out that Delingpole is talking about a hockey stick that was made before Briffa’s work was published. It was right up their alley, and they didn’t even take the easy shots. and pointing out that now he is insisting on trees that don’t show warming, but instead we get a bunch of irrelevant hockey sticks. And note the one chart without a link, is for CO2 which in the past has been higher. The studies that I have read seem to use the borehole temp profiles archived at the university of Michigan website. There very limited metadata about each of the boreholes. So no way to tell if my conjecture about slope change is correct. My heartburn is over the using TLS and ridge regression to get a temperature reconstruction and then calling it the correct reconstruction, noting of course that the number of singular values retained in TLS and the diddle factor in the ridge regression can provide the desired hockey stick shape. There are literally hundreds of peer reviewed journal papers over twenty years period that overlook some basic linear algebra. What is interesting is that Beltrami has visited both Tamino and Steve site when this topic was discussed without any substantial comment. Thanks again Phil. Your comment about the the ridge regression are very sensible to me. It was surprising when I first learned of the math also. Did you post the correct link ? I don’t see a hockey stick. Figure 2 certainly does not have a long flat shaft followed by a sharp rise in the 20th century. Firstly there are (as is usual in climate studies, unique among sciences) no error bars on their graphs. Secondly, there’s a massive discontinuity in the graph in the last decade despite the fact there’s no such discontinuity in world wide temperatures. It looks like they just stuck global temps on the end. Thirdly, their methodology is deficient. A very large number of the boreholes were taken in the US, which had temperatures in the 30’s roughly equivalent to late 20th century temperatures. How can the global temperature trend (which has no such signal) then be used as the forward model for those bore holes. It simply makes no sense. The same goes for other regions, with other unique temperature fluctuations. Another poor paper from UMich. Before I saw a paper that was arguing higher gas mileage requirements would help Detroit. They never did send me their data on that. An nteresting point you make about nobody having done a correction of tree ring data to account for increased growth from extra CO2. I have no idea if anybody knows how much faster the various sorts of trees might be expected to grow at different CO2 levels but the increase in CO2 is certainly well measured. Difficult to measure or not it is certainly a significant factor. If tree ring growth, as corrected by McIntyre, shows, in conventional terms, that there has been no or negative warming then corrected for increased CO2 one would expect a clearer negative trend. groundwater flow rates are only a few feet per year, and rock porosities are only only a few percent, so the amount of heat moved around by flowing water is very small. The fact that borehole temperatures are affected by surface temperatures is undeniable. There is quite a literature on this (unrelated to paleoclimate); these methods were originally developed so that geophysicists could separate out the surface temperature effects and determine the true geothermal gradient (knowledge of which is very important in oil exploration and development). Many of these boreholes are from mineral exploration. The porosity of the rock isn’t what’s at issue – the water occurs in cracks and faults. Underground mines in Canada (and many of the boreholes in question come from Canada) are very wet and need to be pumped. I don’t know much about boreholes for sure and probably deserve to be told so. I do know that we cannot close our eyes to the thermal flow of even a few dozen feet of water per year across rock. I really liked boreholes until I learned what was going on with the data. Then I learned some of the math.